JPS3.5T produces 3.5 to 4 lb. trigger pull with JP Fire Control parts. This kit is intended for use with JP trigger parts and will not necessarily yield substantial change on standard AR-15 trigger components. Application: Use of this spring kit allows for use of ammunition with low-sensitivity primers such as those found in NATO-spec and various foreign-manufactured ammunitions, but in the case of large-frame ARs and duty/defense rifles, domestic-manufactured ammo is strongly recommended to ensure 100% ignition reliability. The JPS4.0 Tactical Spring kit will yield a 4.0-4.5 lb. trigger pull with JP Fire Control parts. This kit is intended for use with JP trigger parts and will not necessarily yield substantial change on standard AR-15 trigger components produces a 4 to 4.5 lb. trigger pull. SPECS: Spring steel. Kit includes red-coded hammer spring, yellow-coded trigger return spring, and disconnector spring. For use on AR-style .308 rifles; not for defense or duty applications. JPS3.5t produkuje 3.5-4 funtów pociągnąć spust z JP ogień kontroli części. Ten zestaw jest przeznaczony do użycia z JP wyzwalacza części i nie przyniesie niekoniecznie istotnej zmiany na standardowych komponentów wyzwalacza AR-15. Zastosowanie: Użycie tej wiosny zestaw pozwala na wykorzystanie amunicji podkłady niskich czułości, takich jak te Znalezione w NATO-spec i różnych zagranicznych produkowane amunicji, ale w przypadku ARs duże ramki i cła/obrony karabiny, domowe produkowane amunicji zdecydowanie zaleca się aby zapewnić 100% niezawodność zapłonu. Zestaw JPS4.0 taktyczne wiosna przyniesie 4.0-4.5 funtów pociągnąć spust z JP ogień kontroli części. Ten zestaw jest przeznaczony do użytku z JP wyzwalacza części i będzie nie koniecznie plon istotna zmiana na standardowych komponentów wyzwalacza AR-15 produkuje 4 do 4.5 funtów wywołać pull. Dane techniczne: ze stali sprężynowej. Zestaw zawiera zakodowane na czerwony młotek wiosna, żółty kodowane wyzwalacza sprężyną powrotną i Rozłącznik wiosna. Do użytku na karabiny AR-styl.308; nie dla obrony lub cło aplikacji. Called JP and spoke to tech. For all around ignition reliability with Military/5.56 ammo stay in the 4.0-4.5 range. Any lighter you run into primer ignition problems/light strikes. For tactical/defense you DO NOT want a lighter trigger. Trust me a 1/2 lb difference is not really noticeable from the 3.5 kit. Bottom line if you shoot mil spec ammo or 5.56 this works. Found out the hard way these won,t change a thing with a stock mil spec trigger. These look to have the exact same hammer spring as mil spec. Bottom line I had the exact same 8 lb. trigger pull after installing these. Do yourself a favor and get the 3.5 version if you want a reduced trigger pull weight. Just make sure to test the reliability with all the ammo you use. Let me start off by saying, one of my lowers has the JP full fire control kit, which by the time all is said and done (kit, speed hammer, anti walk pins) I was well over $200. Now I'm not about to say that swapping out these springs with mil-spec parts is going to result in a trigger as sweet as the JP fire control kit, but it is a tremendous improvement, especially for only $10. Just swap these springs in, grease up the internals, and you will have a decent trigger that is probably between 4-5 pounds which makes a huge difference from the 7+ lb mil spec springs. Just a great, quick, easy, cheap fix. I fitted this set to my Colt lower after experiencing occasional failres to fire, and it brought it back to life. In a 300 round test of a mix of ammunition brands, including reloads; 100% relability in semi or full-auto. Bought a Bushmaster C 15 and it's a nice ar for the money with a very heavy trigger from factory and a jp 3.5 trigger springs made a world of difference . Looking for smooth, reduced trigger pull. This is the item. I reduced my pull from 8.5 lbs to 4.5 to 4.8 lbs. more crisp pull with smooth reset. Nothing I don't like about it. Note: I do get about 1 in 40 misfires using Wolf Ammo but American made works every time. That may be due to the lesser quality of the ammo. The pull is reduced but I do not think it is dangerously so. As a result I install the JP Enhanced Springs on all my ARs. JPS3.5T Enhanced Reliability Spring Kit, is not a $200+ enhanced trigger job, but it is certainly better than the factory springs. Consistent pull, break, and reset at ~4lbs is very much improved over the factory 7+ lbs. 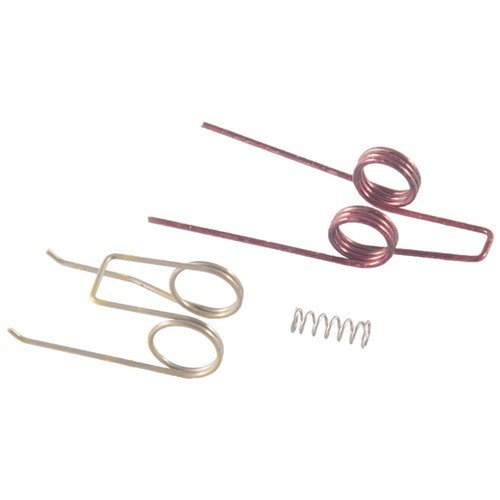 The trouble is that these springs are very popular and most of the time must be back-ordered, additionally they don't sell individual springs must be purchased as a kit (trigger, hammer, disconnector). I will not fault Brownells or JP for $11 I will buy and install on all my ARs. I installed this product in an AR15 primarily used for 3gun. I was amazed by the improved performace of the trigger group. Outstanding up grade for $10.99. I primarily shoot reloads and I have had no failures to fire. If you are on a budget dont hasitate buy this product. Using just the hammer spring brought my stock triggerâs pull down from 8lbs. to 5-5 1/2 lbs. with a consistent break. Using the JP trigger and disconnector springs brought the trigger pull down to about 4 1/2 lbs. but the break wasnât as âdistinctâ for me, so I went back to the stock trigger and disconnector springs. No FTFâs so far after shooting 200 rounds of various ammo ranging from match to duty to foreign surplus. This product exceeded my expectations.